The human feet are amazing. It is an infinitely flexible thing that is very hard for robots to imitate – but it is the 26 bones in each foot that enable us to walk upright. It is also amazing, when you think about it that those few square centimetres of the soles of your feet carry the full weight of your body – which represents quite a bit of pressure per square centimetre. Is it any wonder that these little appendages to our legs get rather tired by the end of a day? Consequently there are few things that can equal the sensational pleasure of a good foot massage. We work them hard all day yet we rarely afford them the pleasure of a good rub to relax all those muscles that control all those bones. 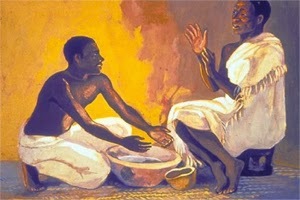 Dusty and arid places take their toll on feet so it is not surprising that many of the peoples who live in such places have social rituals that involve the washing of feet. Here, at the end of his life, Jesus knows exactly how to show his disciples how much he loves them. “He had always loved those in the world who were his own and he loved them to the very end.” In order to express his love for them he washes their feet. There is an incredible intimacy in this story – as there is in the stories of the two women who anointed or washed Jesus’ feet – as Jesus stoops gently and graciously to attend to the feet of his friends. In this simple act of cleansing, Jesus draws even closer to his dear friends. But Jesus was concerned about greater things than just giving hid friends a nice feeling. Where our other Gospel writers tell a story about the Last Supper, John focusses on this gesture of humility and service by Jesus as his ultimate act before the crucifixion. In his conversation with Peter he makes it clear that participation in this is an essential expression of our desire to follow in his Way. He offers this with an ultimatum – “If you do not let me do this for you, then you will no longer be mi disciple.” Accepting this means going all the way to the cross with him. When we let this become a bit more personal we begin to realise that it is about letting Jesus get close enough to us to wash our dirtiest dirt away – the really cleanse us. But this foot washing is more than a personal call to follow Jesus. It is more than a one-on-one experience. Jesus is laying before his disciples a sacramental vision: a vision of the promises between God and us. It is a vision of Christian community at its best. Interestingly foot-washing has never been elevated to sacramental status in our protestant tradition, it certainly has elements of sacrament. A sacrament is an outward and visible sign of an inward spiritual reality. This sacrament conveys to us a vision of what can be in the community of God’s people. We need such visions, visions of what we are striving for, visions of how God wants us to live with one another. American novelist and poet Wendell Berry wrote a wonderful story he called Jaber Crow. The main character in the story is the town barber who is also the church cleaner. One day, after he had been doing this faithfully for a number of years Jaber had a kind of epiphany or revelation about this congregation of people he knew so well. An overwhelming vision takes hold of him. He sees the community of this congregation “perfected beyond time by one another’s love.” It is a vision of the community as it will never be: PERFECT. But what Jaber sees is powerful enough to feed his faith and keep him moving towards something better than this present reality. Jesus left his Disciples and us with that sort of vision. His parting gift to us all is a stunning image of Christian community at its best. He leaves us with a vision of a place where Christian brothers and sisters love and care for one another as he has loved us. This is a picture for us of Jesus’ very commandment to us to love one another as he has loved us. Jean Vanier, founder of the L’Arche communities around the world describes it in these words, and then asks us two questions. “To wash the feet of a brother or sister in Christ, to allow someone to wash our feet, is a sign that we want to follow Jesus, to take the downward path, to find Jesus’ presence in the poor and the weak. “Is it not a sign that we too want to live a heart-to-heart relationship with others, to meet them as a person and a friend, and to live in communion with them? It is in this that these two sacraments merge tonight – the foot-washing as a sign of our love for one another, and the Holy Communion as a sign of God’s eternal and cosmic love for us all. I think a lot about life and the happenings of the world around me. My blog will give me a forum for expressing those thoughts. I hope you enjoy following.